Jury selection begins next week in the Chicago terror trial of Tahawwur Hussain Rana, charged with participation in the 2008 Mumbai bombings, the planned attack on a news agency in Denmark, and providing matierial support to Lashkar e Tayyiba (LeT.) The Second Superseding Indictment is here. Both Rana and the Government's star witness, former DEA informant David Headley, who cooperated in exchange for taking the death penalty and extradition to India and Pakistan off the table, insist they were receiving instructions from Pakistan's ISI and military. While the Judge won't let the information about ISI and Army in the front door, it's bound to come in the back door. Today the Court entered a minute order directing Rana to respond to the Government's motion to exclude his expert witness, Marc Sageman. Sageman is a counter-terror expert, former CIA agent and psychiatrist who is the leading proponent of the theory that al Qaeda as a central organization is no longer a big threat, that Pakistan houses the main terror groups in the region. Here's his 2009 testimony before the Senate Foreign Relations Committee. Global terror is more of a grass-roots thing in recent years, composed of leaderless jihadis. They may be affiliated with or inspired by al Qaeda but al Qaeda, the core group, is too weak to provide much more. What's Holding Up U.S. Interrogation of Osama bin Laden's Wives? Pakistan and the U.S. say they are still in dialogues over the U.S. "interviews" of Osama bin Laden's three wives. What's holding it up and why does Pakistan say it has not yet received a formal request for access? India today released its dossiers on the five new defendants in the upcoming federal terror trial of Tahawwur Hussain Rana, charged with conspiracy in the Mumbai bombings and planned attack in Denmark. Rana will be on trial by himself, as none of the others have been arrested. David Headley, aka Daood Giliani, who was originally a defendant, will be the star witness against Rana, having cooperated and pleaded guilty in exchange for avoiding the death penalty and extradition to India or Pakistan. New charges have been filed (pdf)in Chicago against accused terrorist and former DEA cooperator David Headley, aka Daood Gilani. The U.S. Attorney's office confirms he is cooperating with both the investigation into the Danish newspaper plot and that of the 2008 Mumbai bombings. The text of the new complaint is here (pdf). In March 2008, Headley and his co-conspirators discussed potential landing sites for a team of attackers who would arrive by sea in Mumbai, and he was instructed to take boat trips in and around the Mumbai harbor and take surveillance video, which he did during his visit to India starting in April 2008, the charges allege. 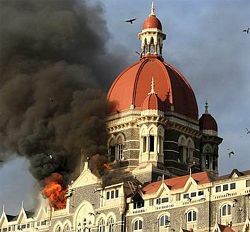 At various times, Headley allegedly conducted surveillance of other locations in Mumbai and elsewhere in India of facilities and locations that were not attacked in November 2008, including the National Defense College in Delhi, India.